Who decided it would be a good idea to make Christmas lawn decorations that would only display if you turned on a fan to inflate them? I suppose the theory is valid. 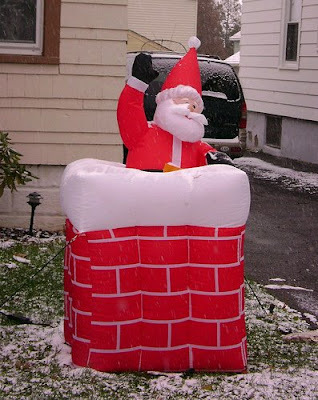 You can have a large, puffy, colorful, 3D illuminated Santa bobbing and weaving in your front yard throughout the entire Christmas season and be the jolliest house on the block. And for the 5 hours every night that you power them up, they look like this. The problem is... you have to keep the fan ON! These are just a few of the yards you'll see along the route between my house and Roseanna's karate studio. The funny thing is, I had this idea all queued up to do the other day before Doozie left this comment on my post yesterday. ... and I despise those blow up lawn deco's. I think this year I will take my shovel around and bash those things. Hmm, I thought I saw her lurking around here last night. Emma was just asking us this morning why our penguin fell down over night. heh heh. I have to say, I'm with Doozie on the lawn ornaments. jen - Just be careful about hanging around with Doozie. She'll get you in trouble every time. I can't stand those either...it's so morbid to see Santa look like he was run over by a snow plow during the daylight hours. It looks like someone went on a shooting spree. God, what's the body count? Hilarious and Stumbled! My brother only recently got a place with a lawn, but cannot control his urge to buy decorations, hence my custody of two inflatables. He finally took most of them to his yard, but I still have a santa and a penguin that collect dust if I don't use them. I also have a husband who's particularly squeaky about the electric bill lately; ergo: two flat blobs in the yard 18 hours of the day. jen - That sounds like fun actually. She's one wild and crazy gal. sandy - And you thought Grandma got run over by a reindeer! kathy - Investigators are still trying to tally the total. It ain't pretty though. gette - I'm still waiting for someone to sell a box that looks like a Christmas package that stores your deflated Santa during daylight hours. Then you just slip the top off and blow it up! I know... genius. They scare my poor dog to death! We can't walk down certain streets because of the terrifying blow-up lawn ornaments! Here in the ghetto the only decor you might see is an empty egg nog carton in the gutter. I wouldn't take a shovel to them. I'd take a giant pin! Someone with a sick sense of humour came up with this, I'm sure. VE, with my shovel no doubt? That is quite a festive sight. I'm trying to decide if I'm gonna put out lights and turn down the heat? Or am I gonna keep the heat up so I don't have to resort to wearing three pairs of socks and three shirts? I like the yard ornaments, just too broke to participate! The evil side of me wants to go around and take out all the blowup yard deco with a BB gun. Of course then CSI would get involved and I'd be indicted for some kind of religious hate crime simply because I shot a BB gun at balloons for the sheer hell of it. What is up with that one that looks like an elf hung himself? What is that even supposed to be (besides traumatic)? I can deal with ONE per yard; I even kind of like the snow globe ones - it's the only way we get to see snow, usually. But more than that and I want to knife them. I guess I'm not the only one; that's on the news a lot. A few years ago, some neighbors had a couple of inflatable pumpkins in the yard for Halloween. On on particularly windy day, the two large udulating pumpkins were blown together. Thereafter my entire family referred to them as "The Humpin' Pumpkins". That is way too funny. I will pass this year. Baaaa humbug!!! 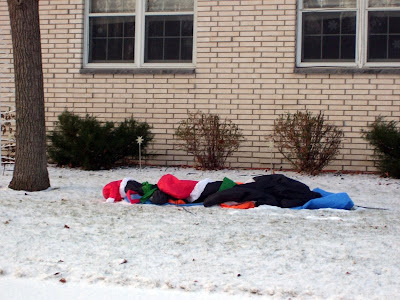 Several yards in our neighborhood look like they were host to drunken Santa/snowman/penguin parties. Someone took our neighbor's reindeer (the one whose head is down) and put it backwards on the one whose head is up. Not very nice, but kinda funny. 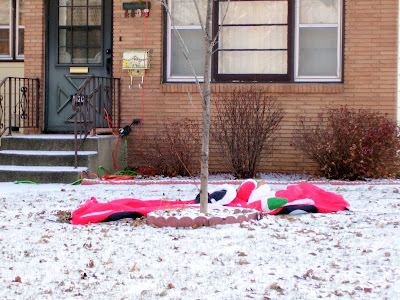 Try explaining why Santa is not really dead and lying in your neighbors yard to a 2 year old. That's fun. Those things do look pretty sad all deflated. I have tears in my eyes...seriously, LOL! This is so true - it's the new tragedy of yard decorations. Call the cops -- there's been a homicide! 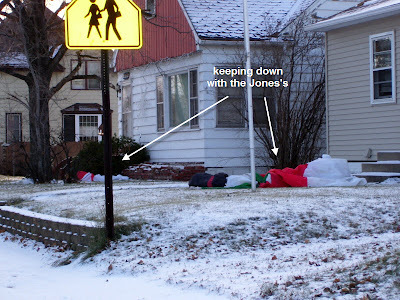 Santa Claus down. 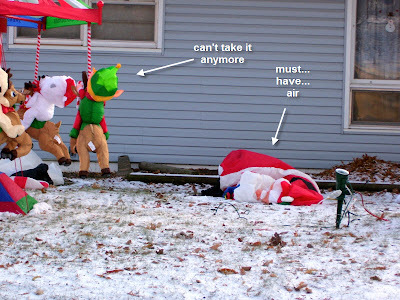 I repeat, Santa Claus down! You should be using all these days off to pitch and market that box thing. michelle - I'm pretty sure the power company invented Christmas! elizabeth - I know how he feels. Some people's yards scare me too. babs - How sad is that? Where do you live... Grinchville! ve - Ya gotta watch out for her. Especially her left hook. doozie - Ya thanks. I take my inspirations where I can get them. 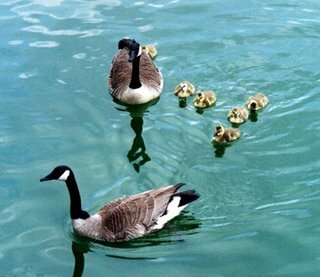 but momma - Hang in there. In a few years they'll have LED lights that are brighter and consume next to nothing in energy. Then EVERYONE will be able to decorate! chris c - Is shooting Santa really a religious hate crime? Now, if you were shooting at an inflatable Jesus, then maybe. kc - I thought that suicidal elf was funny too. He's really just supposed to riding a carousel... because who doesn't have a carousel in their front yard? doug - Yeah, but those pumpkins didn't get very far because Jack-o had a hollow weinie. Ba-dum! shyloh - So I can expect Inflate-a-Christmas from you next year then? mom thumb - Maybe I should drive around and throw empty booze bottles in all these people's yards. Now that would be funny. ed - Just think of the money you could save though by telling your kids that Christmas has been canceled because Santa is dead. april - Are you saying people in Los Angeles don't deflate their Santas? heather - Check it out in your town too. You'll see deflated blobs on every street. Very odd. drowsey - Yes, I think the lawn ornament of the fat lady bending over has finally met its match. 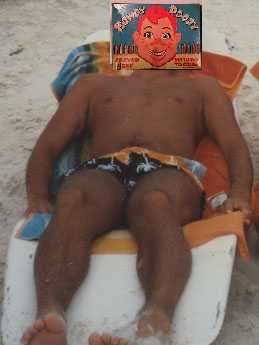 chubbs - Funny. I could see someone running one of these pics and hosting a caption contest. gette - Too late... vacation's over! I wonder about the empty booze bottles Mom Thumb wrote about? I do virtually NO decorating. Our house is the only dark house on the street. But some of the other houses make up for it. 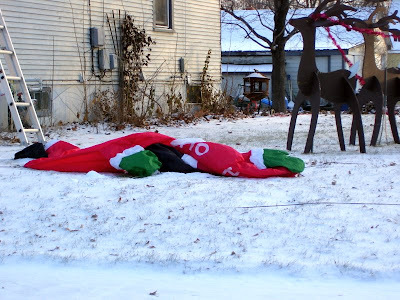 Hey, I didn't say anything about booze bottles, but I like the idea of throwing them into the yards of deflated Santas. Sorry Linda, Jeff has the empty booze bottle idea. I did not think anyone in Oklahoma would throw away an empty booze bottle. Around the corner from my house sits a blowup of Snoopy atop a motorcycle. Nothing says Merry Christmas than a cartoon beagle riding a motor vehicle. It hurts my eyes. Can't wait til this trend passes. 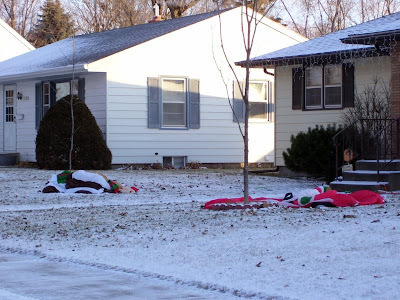 Not a fan of the "blowups" for that reason, they look really dumb just lying there all deflated and depressed. Oh my God, it's a massacre! Looks like Pepper Spray cop has struck again.